This is Gerry’s tiny house. It’s a Tumbleweed EPU that he built from plans with the help of friends. He started building in November 2008 and in the first part of 2009 it was ready to move to a new home in Victoria, BC. The house wasn’t complete but very livable. The journey covered about 800km which they did in one long day – through the snow and over one ferry crossing. The cost to build the house was about $15,000. This entry was posted in Tiny House Projects and tagged Add new tag, canada, gerry, tiny house, tumbleweed. That last photo looks pretty treacherous. Glad I wasn’t driving. >That last photo looks pretty treacherous. Glad I wasn’t driving. Yeah it’s a safe bet Gerry is going to have a lot of stories. I’m glad I wasn’t driving either!! Some amazing friends of mine helped me with the move and did the driving. It was a long crazy day that is thankfully fading from memory. Amazingly nothing went wrong or broken. The next time I move the house will be in better weather! Hi Gerry! We can’t wait to hear more about where you and your tiny house are now. Drop me a line when you get settled! Hi Gerry! Tumbleweek no longer sells the Epu building plans. Do you still have a copy or know where I can buy them from? Me and my Dad are building an Epu for me this fall! Thanks!!! 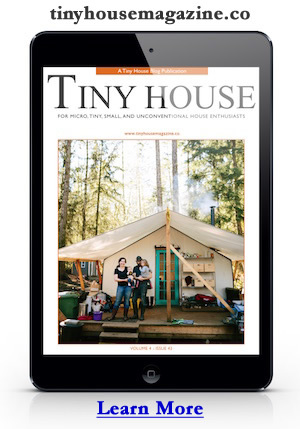 I love the tiny house, but curious about the inside layout, I just came across this today, and don’t know if you already showed that, also if you don’t mind me asking how much did it cost to build it? The house in video can be built by a DIYer for about $20,000. Tumbleweed can do it for you for about $46,000. But many people are building for less by cutting out some high cost features. In your opinion, where could we reduce the cost? A couple things does anyone know where you can get financing? What kind of loan mortgage , recreation vehicle or personal? Ok I’m planning on building one so have started making a list of what I will and will not do with out. Compost vs rv toilet? I have a mr heater prone heater I bought for back up but haven’t ever used it so use it or sale and put to ward a boat heater. These are the kind of things. I could talk all day about this but won’t have a good weekend.